In the winter months I love warm, savory food. There is something special about coming in from the cold to a cozy house that smells like good eats. I knew this recipe was a keeper when after a monster bike ride, The Cyclist came in the door and the first words out of his mouth were "something smells good". Win. This chicken pot pie is from the American Heart Association's recipe page. I absolutely love pot pie, but the pre-packaged kind tend to have 30+ grams of fat per serving. Not good. As soon as I saw this healthier version, I knew I had to make it. After getting all of the goods at Save Mart, I got to work. This dish gets its flavor from all of the seasoning, fresh herbs and veggies. Not pictured - Parsley, it comes later. A couple of notes here: I used fresh pearl onions because Save Mart did not have any frozen. If you have the option to use frozen, I would do so because it takes a long dang time to peel those fresh onions! Also, when I couldn't find button or Crimini mushrooms, my friendly Save Mart produce man told me that they are the same as Italian Brown. Learn something new every day. The recipe calls for a salt free all purpose seasoning, I chose good ole' Mrs. Dash because it's what my mom always had on hand. It had been awhile since I'd had Mrs. Dash and I was impressed by the amount of flavor it has without salt. I was also happy to see the recipe called for turmeric. I met turmeric awhile ago and I really love it. You can dye a shirt with it too. You'll notice the recipe does call for salt, but it's only a tad bit - 1/2 teaspoon. One more thing. This recipe calls for a liquor called Pernod. I thought I had never heard of it, but when I googled it I recognized the bottle. My Save Mart did not carry this, but to be honest, I don't know that I would have bought it even if they did. The likelihood of us using it outside of this recipe is probably pretty slim. Mark my words though, because now that I've said this I'm sure I'll probably find another recipe that calls for it. Once you've got all your ingredients together it's time to start cooking the filling. I like that this recipe has you saute the herbs a bit before adding the other ingredients. I used my biggest skillet. You should use your biggest skillet too. Once your filling is done, it's time to make your crust dough. Because it's doughy and crusty. Er, not crusty but you know, crust-y. The recipe has you roll it out on plastic wrap. Do this. You will have to flip it on top of your filling. It is a sheer miracle I was able to do this on my own. The Cyclist is the dough master of our domain. Full disclosure here. The recipe calls for a trans-fat free margarine spread. We don't eat margarine. I used unsalted butter instead. This obviously upped the fat content, so if you are eating a heart healthy diet you can either follow the recipe and use the margarine, or, make sure using the butter doesn't put you over your daily fat intake. To note, the unsalted butter I used was also trans-fat free, so this is still a trans-fat free crust. Once you've rolled your dough and precariously flipped it onto your filling you should give yourself a pat on the back for accomplishing such a difficult task. I did. The recipe says you should put your filling in a 3 quart casserole dish. 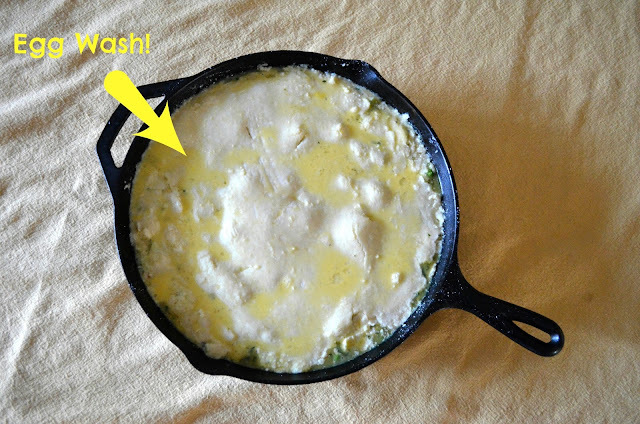 I don't have one of those, so I instead used our cast iron skillet. I also opted to use the recipe's suggestion of putting an egg wash on the finished pastry. As you can see my crust doesn't exactly go all the way to the sides. Since my name is not Martha this is acceptable. You can get this baby baking now! While you're pie is in the oven I've got something else for you to do. The recipe says to serve the pot pie with olive oil mashed potatoes, but I couldn't find a recipe on American Heart Association's website, so I created one for you. Typically I add more salt to mashed potatoes, but these didn't need it and they were super easy to make. The recipe is down below, you can easily make these taters while your pot pie is cooking. Once you're done you'll have a tasty and heart healthy meal, that makes your house smell like home. Because I am a full-time working lady, I will say that I probably wouldn't attempt this dish on a weeknight. There is a lot of chopping involved my friends. Not to mention there is also dough involved, which usually totally freaks me out. That said, you can make the filling a day in advance, which would make the process a bit easier. The Cyclist and I both thought this dish was really good. It is both hearty and tasty and you won't miss the added salt. I am a crust lover and usually I would opt for the traditional pot pie which has the filling encased in a full crust (as opposed to just a crust on top), but I have to say, I didn't miss it. The filling is really good and with mashed potatoes on the side, you really don't need all that crust. This would be a great dish to make if you are having friends over for dinner too. I used fresh pearl onions instead of frozen. If making this dish again, I'd opt for frozen simply to save time on peeling those babies. I did not use the Pernod. I used unsalted butter (which is trans-fat free) instead of a trans-fat free margarine spread. I used a cast iron skillet instead of a 3 quart casserole dish. I did the egg wash as suggested by the recipe. That's it! You can find the full recipe here. Boil the potatoes until soft, about 15-20 minutes. Using a stand mixer, mix with the paddle attachment until the potatoes are broken up. Switch to the whisk attachment and whip potatoes until smooth. If you're using a hand mixer, first break the potatoes up with a wooden spoon. Then, using your hand mixer, add all ingredients and mix well. Switch to a whisk and whip potatoes until smooth. looks so good I'm going to make one for our company dinner Thurs evening. It is a great recipe for a small group, hope everyone enjoy's! Hi The Cyclist Wife, thanks for the recipe. I was looking for a pot pie recipe that is low in fat and calories. I have been eating Marie Callender's pot pie(600 calories per serving) but only eating half of the pie at one sitting. I can make this for me and the hubby. Bookmarking this post! Hi FE! Thanks for stopping by. Yes! 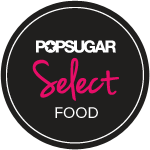 That is why I loved this recipe, lower in fat and calories but not missing any flavor. Hope you enjoy! 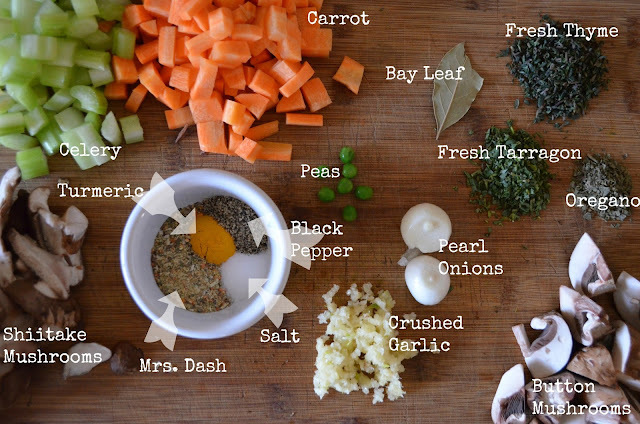 Your Chicken Pot Pie looks awesome and perfect for these cold winter days. 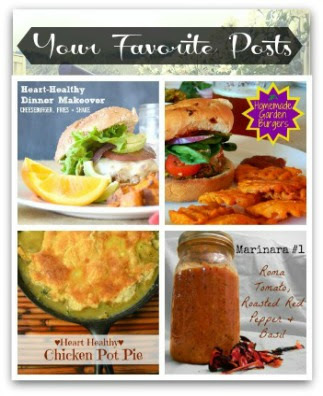 Hope you have a great weekend and thanks for sharing your tasty recipe with Full Plate Thursday. Thanks Miz Helen and thanks for hosting the linky! Just merely looking at it makes me hungry...And Oh BTW youve got really nice instructional presentation of your ingredients in here. Thanks Cielo! It was really good, let me know if you try it. Thanks Jessica, I hope you enjoy it! WOW!!! LOVE this! Thank you SO much. :) I already printed a copy for my kiddos, as I think this is a GREAT way to open their eyes to what's actually in the easy heart healthy food s they want to eat. 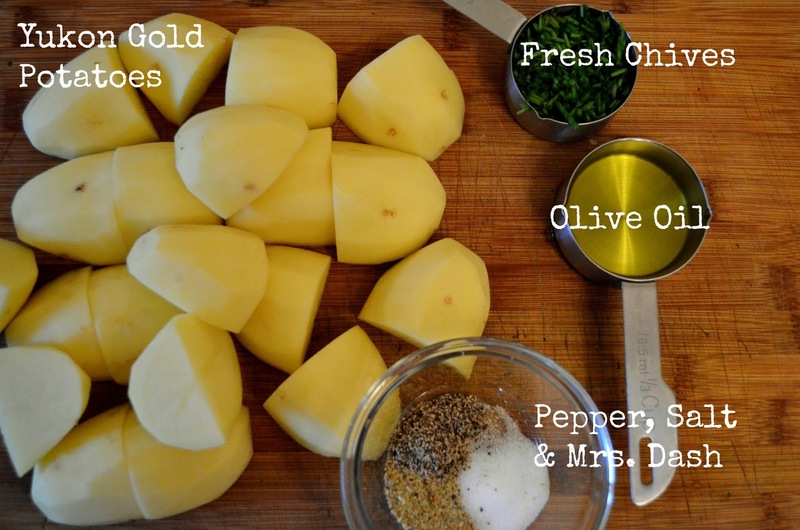 What is the olive oil for in the mashed potatoes pic? Is that supposed to be milk? For being a paid endorser, I would think your info would be more accurate but I appreciate the recipe. Hi anonymous, thanks for stopping by to comment. No, that is not supposed to be milk, it is actually olive oil just like it says in the picture. I believe you were trying to ask me if I accidentally left the olive oil out of the recipe and you are correct, I did. My mistake. Considering the recipe is called Olive Oil Mashed Potatoes I'm sure most people figured out my mistake, but thanks for pointing it out. I've corrected it. With regard to your comments about being compensated for the post, let it be known that I was compensated with the ingredients I used for the recipe and that is all. 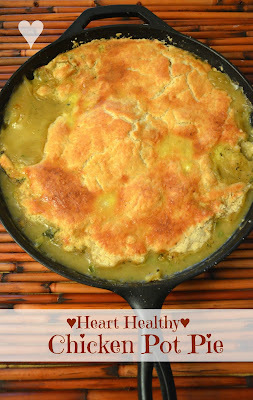 I was asked to cook a recipe from the American Heart Associations site, which I did (the Pot Pie). Their recipe notes to serve the pie with a side of Olive Oil Mashed Potatoes but they don't offer a recipe for that. So, I created one and added it along with the post, which was my decision and not part of the assignment. I hope you enjoy the pot pie!